New research led by University College London (UCL) and Woods Hole Oceanographic Institution (WHOI) provides evidence that a key cog in the global ocean circulation system hasn't been running at peak strength since the mid-1800s and is currently at its weakest point in the past 1,600 years. If the system continues to weaken, it could disrupt weather patterns from the United States and Europe to the African Sahel, and cause more rapid increase in sea level on the U.S. East Coast. "Our study provides the first comprehensive analysis of ocean-based sediment records, demonstrating that this weakening of the Atlantic's overturning began near the end of the Little Ice Age, a centuries-long cold period that lasted until about 1850," said Dr. Delia Oppo, a senior scientist with WHOI and co-author of the study which was published in the April 12th issue of Nature. Lead author Dr. David Thornalley, a senior lecturer at University College London and WHOI adjunct, believes that as the North Atlantic began to warm near the end of the Little Ice Age, freshwater disrupted the system, called the Atlantic Meridional Overturning Circulation (AMOC). Arctic sea ice, and ice sheets and glaciers surrounding the Arctic began to melt, forming a huge natural tap of fresh water that gushed into the North Atlantic. This huge influx of freshwater diluted the surface seawater, making it lighter and less able to sink deep, slowing down the AMOC system. "Combined, these approaches suggest that the AMOC has weakened over the past 150 years by approximately 15 to 20 percent" says Thornalley. According to study co-author Dr. Jon Robson, a senior research scientist from the University of Reading, the new findings hint at a gap in current global climate models. 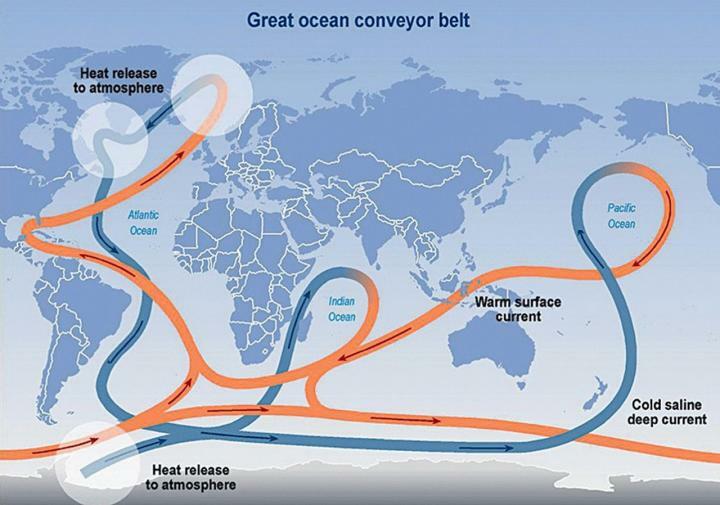 "North Atlantic circulation is much more variable than previously thought," he said, "and it's important to figure out why the models underestimate the AMOC decreases we've observed." It could be because the models don't have active ice sheets, or maybe there was more Arctic melting, and thus more freshwater entering the system, than currently estimated. "What is common to the two periods of AMOC weakening – the end of the Little Ice Age and recent decades – is that they were both times of warming and melting," said Thornalley. "Warming and melting are predicted to continue in the future due to continued carbon dioxide emissions."